Editor's note: For security reasons, Currents is using pseudonyms for the Iraqi students in this article. Aram is 20 years old, but he'd never experienced a full day of electricity until he came to America a few weeks ago. "The generators only work for seven to eight hours a day," said Aram, an Iraqi business and management student who attends a Western-style university in Kurdistan. "In the winters, it's hard, because we live in a mountainous place. And the summer is really hot." Aram, one of 17 students participating in the Iraqi Young Leaders Exchange Program at UCSC this summer, is experiencing 24-hour-a-day electricity and many other American conveniences during a six-week course sponsored by the Bureau of Educational and Cultural Affairs in Washington, D.C. UCSC is one of only six universities in the nation to host the program, which is in its second year. The program, run through UC Extension and managed by international education and development nonprofit World Learning, provides opportunities for Iraqi youth to participate in classroom study, learn first-hand about the United States, and develop leadership and problem-solving skills they can apply in their society. "They're just wonderful students," said Susan Miller, director of Education and International Programs at UC Extension, Santa Cruz. "I see great hope for Iraq in this group. If these kids can be in charge, there's a very bright future, because they are so smart, so eager to learn and to experience life here. They're going to go back with lots of dreams and memories that will hopefully carry them to a new future." Three students volunteered to speak with Currents about the program and their experiences in the United States. 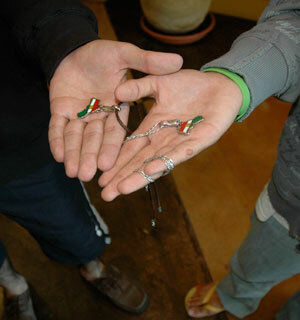 Though students come from all over Iraq, all three volunteers were Kurds. Kurdistan, an autonomous federal entity, is in the northern part of the country and less affected by the Iraq War than other parts. President Bush and Iraqi Prime Minister Nuri al-Maliki announced the Iraqi Young Leaders Exchange initiative in a joint press conference in 2006. About 100 Iraqi university students are participating in the program this summer. The participants, recruited in Iraq through a nationwide, merit-based selection process, take part in six-week intensive study institutes. Each student is assigned to a specific thematic institute based upon its relevance to his or her major course of study in Iraq. More than 250 Iraqi students applied for the program, according to Goli Ameri, assistant secretary of state for Educational and Cultural Affairs in Washington, D.C.
"We're looking for rising leaders," she said. "The one unifying factor for us is leadership capability. So these kids already come with a desire to make a difference." The program is part of the Study of the U.S. Branch program, which each year brings a number of different undergraduates from a wide variety of countries to the United States for four to six weeks of intensive academic study, said Ameri. "Every study program focuses on some fundamental understanding," she said. "Especially for this Study of the U.S. Branch, a focus on the fundamental American values of democracy, individual rights, and tolerance are very much emphasized, as well as problem-solving skills, thinking, and communication. Service and volunteerism are also part of all the exchange programs we do." At UCSC, the study theme is Science and Technology. UCSC received the program in part because "it's focused on science and technology, which is a very important field for these people," Ameri said. "And being close to Silicon Valley was another factor." Since arriving in Santa Cruz, the students have done volunteer work at the Homeless Garden Project and the Boys' and Girls' Club of Santa Cruz. They've witnessed a murder trial, interviewed Americans, visited Sacramento, gone to classes on leadership, and chowed down on burgers, burritos, and fried chicken. As part of the science and technology component of their study, they've done tours of local high-tech companies and visited the Computer History Museum, the Intel Museum, and the NASA Ames Research Center. Beyond checking out American customs, norms, systems, and luxuries, the students are here to learn, and take that information back to their homeland. They're taking a course on American Studies to get an overview of the social fabric in the United States; a course on the effect of science and technology on American society; a component on leadership; and courses in English. Being in contact with American institutions helps the Iraqis see the way young students at universities think, and how much critical thinking and questioning of ideas happens in classrooms, said Educational and Cultural Affairs' Ameri, a native of Iran. "In the Middle East, critical thinking is not encouraged," she said. "They come here and they see there's no rote learning going on. Kids are thinking of ideas and making decisions, and the professor is there more as a guide." Information technology student Mistan, 18, also of Kurdistan, would "like to get the hang of electronics." "It's really cool around here--the revolution of technology is so fast," he said. "We have iPhones and things like that, but we import them--we don't make them there." Medical student Mobed, 20, wants to see a medical facility so he can compare it to the ones back home. But he also wants to tell his friends, family, and neighbors about Americans and life in the United States. American equality has impressed him. "There's no separation between religions," Mobed said. "In our country, there's inequality. That's one of our main problems." Americans who come into contact with these students will get a far deeper understanding of Iraq and its youth and how they see the world, said Ameri. "People realize how much they have in common," she said. "In fact, they find they have a lot more in common than they don't." The bureau does exchanges with 165 countries around the world, according to Ameri. Note to reporters: You may contact Susan Miller, director of Education and International Programs at UC Extension, Santa Cruz, at smiller@ucsc-extension.edu.